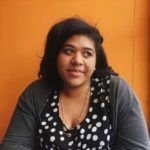 Submit to the Jeffrey E. Smith Editors’ Prize before October 15! 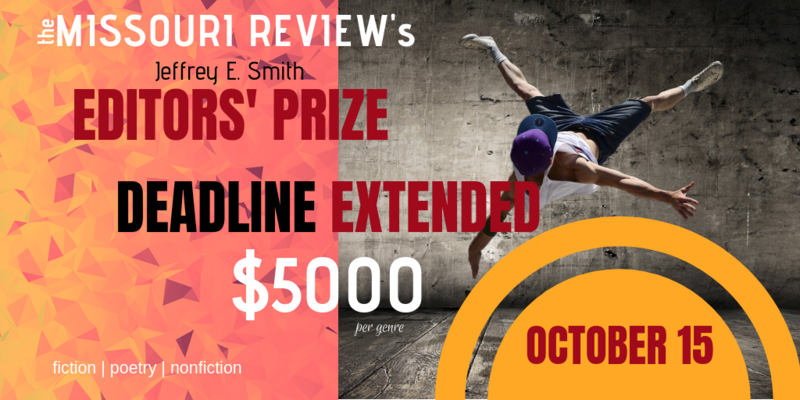 The Jeffrey E. Smith Editors’ Prize extended deadline is October 15. That means you have just another week to submit your entry. 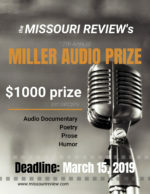 Winners in fiction, nonfiction and poetry will each receive $5000, publication in the Missouri Review, and a paid trip to a reading and reception held in their honor in Columbia, Missouri. All entrants to the contest will receive a one-year digital subscription of TMR and a paperback copy of Trouble in Mind: The Short Story and Conflict, an anthology of our favorite Jeffrey E. Smith Editors’ Prize fiction winners and runners-up from the past 28 years. See our contest page for guidelines and to submit your entry today!